Kolkata, the capital city of West Bengal, and my birthplace is well-known for its gastronomic delights. It’s impossible to write about everything it offers in a single post, so I’ve selected just a few of the best foods to eat in Kolkata (formerly known as Calcutta) here. If you’re planning a visit to Kolkata (the city of joy) anytime soon, you’ll know at least what to eat.Being a girl born into a Bengali family, food is synonymous with happiness for me! For those of you who don’t know much about our community, let me share a few delightful insights. 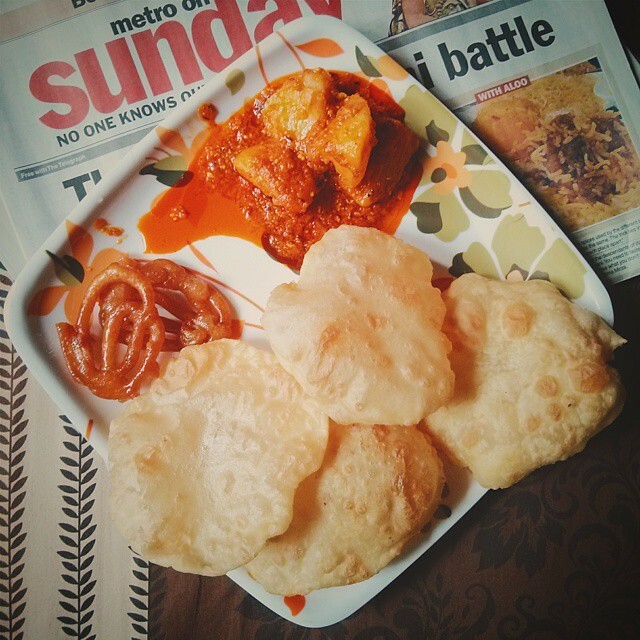 Food and football are a true Bengali’s (or Bongs as some people call us) first love. Sure, it might sound like a stereotype, but honestly, I’m yet to meet a Bengali who isn’t passionate about either of these. For most of us, food surpasses the love for football though. Trust me when I say that, in many Bengali households, the conversation at the breakfast table is mostly about what to have for lunch. And once lunch is served, the inevitable question that arises is, what should we have for dinner? The thing you need to understand about Bongs is, we are a passionate lot. We don’t do a lot, but whatever little things we do, we do it with the utmost passion. We enjoy the finer things in life. When it comes to food, we savor it with the utmost passion. Keep reading for the best food in Kolkata. Mostly made for breakfast or dinner, Luchi is a flat-bread made from flour and deep-fried in oil. The dough is made into small little balls and then flattened using a rolling pin. It is then immersed in a boiling hot oil-bath and gets done in a few seconds. It is mostly accompanied with Alur dom – a dry potato curry that’s a little hot, a little sweet, and a little tangy. The homemade Luchi – Alur dom is undoubtedly the best, but if you’re looking to try it at a restaurant, you’ll find them at Bhojohori Manna, Oh! Calcutta, or 6 Ballygunge Place. 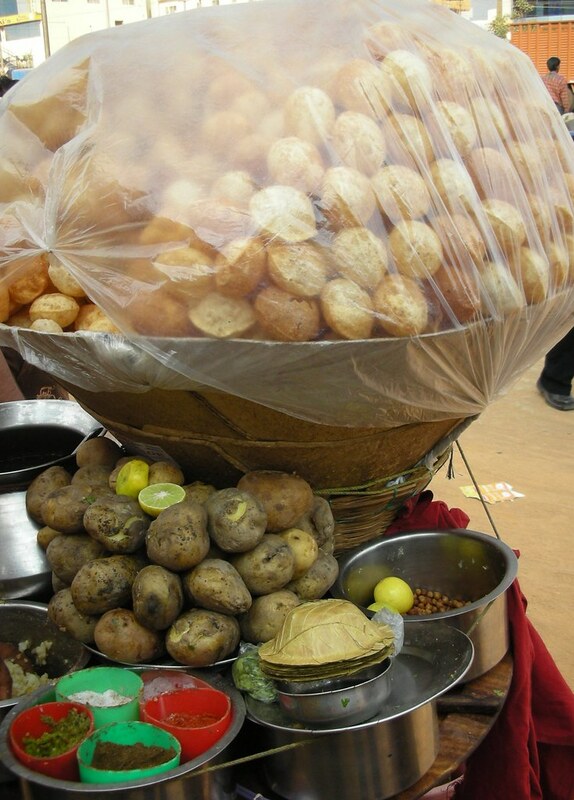 In my opinion,Phuchka is the best street food in Kolkata or even the world! It’s crunchy on the outside, with a filling of mashed potatoes mixed with the tastiest of spices and some tangy tamarind water. When you pop one of these in your mouth, your taste buds are likely to somersault in excitement! A word of caution for first-timers though – ask the vendor to go easy on the chilies. The vendors at Vivekananda Parkare known to make the best Phuchka in Kolkata. .Bedwin is probably the most famous for its rolls in many variants such as single egg-double chicken, double egg-chicken, and mutton rolls. This is a sweet unlike any other. Small little cottage cheese balls are first boiled and then immersed in sugar syrup to make them. You can find them at any of the innumerable confectioneries or sweet-shops in Kolkata. Bhim Nag, Balaram Mullick & Radharaman Mullick, Mithai, and Nalin Chandra Das and Sons are some of the most famous ones. Another delectable delicacy that you won’t find anywhere apart from Bengal. If I were to describe it, it’s somewhere between panna cotta and yogurt, only way better. You’ll find it at any of the sweet shops, however, if you’re looking to get your mind blown, head over to Amritin north Kolkata. When in India, you’ll mostly hear about two variants of Biriyani – the Hyderabadi and the Lucknowi. Few people know there’s another lip-smacking variant – the Kolkata Biriyani. The rest of India don’t get why we include a big round potato in our version of this dish. But if you ask us Bongs, that potato or “Aloo” is our favorite part of the dish. For most of us, if that “Aloo” isn’t done well, it can ruin our Biriyani experience totally. Head over to Arsalanto taste what I’m talking about. This is another traditional Kolkata dessert and is the generic name given to all variants in this category. Available in a variety of flavors and shapes, this is essentially a sweet made from cottage cheese. My favorite is the type we call “Norom Paak” that has a consistency that’ll literally melt in your mouth. Try the various types of Sondesh at Balaram Mullick & Radharaman Mullick or Bhim Nag for an out-of-the-world experience. For the past few hours, I’ve been fighting a battle in my heart for not being able to talk about all of my favorite foods of Kolkata. That list is endless and you have no idea how I was struggling to decide which to write about and which not to. I hope this post helps you out on your food tour of Kolkata! Have you tried any of these traditional foods from Kolkata? I was very impressed by the kathi rolls I ate in Kolkata. They are so simple yet so tasty. I also at a coconut flower while in the city and was blown away by its texture and flavour.